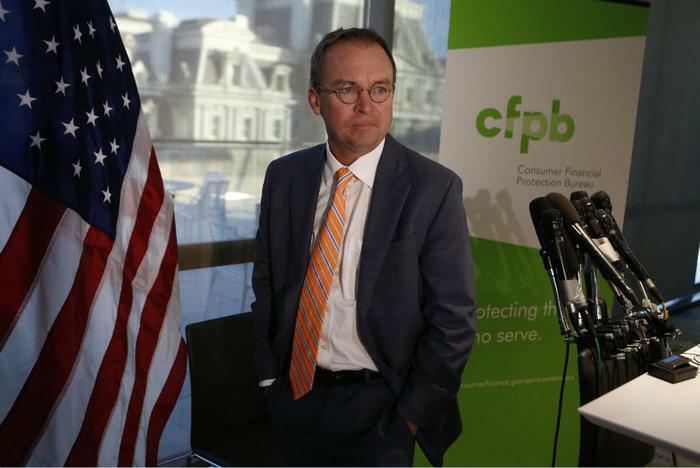 A day after 11 members of the Consumer Financial Protection Bureau (CFPB) Advisory Board (CAB) questioned the agency's leadership under acting director Mick Mulvaney, CFPB dissolved the current board. “By both right-sizing its advisory councils and ramping up outreach to external groups, the Bureau will enhance its ability to hear from consumer, civil rights, and industry groups on a more regular basis,” the agency said. The just-dismissed members of the CAB come largely from academic and community activist backgrounds, focusing largely on consumer issues. The CAB's mission, at least in the past, has been to help consumer groups have input into CFPB policy. One of those groups, Allied Progress, charges that Mulvaney has made no secret of his dislike of the agency's role, voting to abolish it when he was a member of Congress. In an appearance before a House committee last month, Mulvaney suggested Congress take an active role in controlling the CFPB. Karl Frisch, executive director of Allied Progress, charged Mulvaney dismissed the CAB because he doesn't want to hear from consumers. Earlier this week, 11 members of the CAB released a letter to Mulvaney, expressing their “deep concern” about the direction of the CFPB under his leadership. “As the bureau unilaterally shifts its mission from one prioritizing consumer protection and upholding fair market practices to one focused on industry regulatory relief—we see families, once again, being left behind,” said Ann Baddour, who at the time was chair of the CAB. Baddour and other members complained that under the current leadership, the bureau isn't holding regular meetings with the CAB, as called for under the Dodd Frank law. In its statement announcing changes to the CAB structure, the CFPB said “the bureau will continue to fulfill its statutory obligations” under the law.